Hopefully Ben Rix will be at Edgar Street shortly to bolster the Bulls' midfield. The Crewe injury situation is improving and manager Dario Gradi says that as soon as either Lee Ball or Tony Grant are considered fit then 23 year old Rix will be able to come to Hereford United. "We'd let Ben go out on loan to further his career. We're happy to have him here, but he could go out on loan as soon as I've got Tony or Lee fit," explained the Crewe boss. Neither Ball or Grant featured for Crewe yesterday. Rix came on for eleven minutes replacing Martin O'Connor who is on his way back from injury. Immediately after the Bulls beat Macclesfield, manager Brian Horton was relieved of his duties by the Macclesfield board. Horton joined the club in April 2004 saving the club from relegation, and took them to the League Two play-offs in his first full season. Last season was a struggle as budget cuts took hold leaving the club just five points from relegation, and the Silkmen had failed to record a victory in 13 league and cup matches so far this season. Andy Williams has told BullsEye his feelings about press talk of a possible move to Bristol Rovers. "I'm not really worried about any of that sort of talk. I wouldn't want to go elsewhere in the same division. "If I moved on hopefully it would be at a higher level. "If the gaffer were to be interested in offers I would have to think about it. "If the gaffer doesn't accept any offers then I'm more than happy to stay here. "My focus is on starting to play a bit better, scoring a few more goals and getting the Bulls further up the Division Two table." Meanwhile Hereford United had a scout at Crewe today according to their Official Website. Adam Stansfield is eight games without a goal after Exeter beat Southport 1-0. Bertrand Cozic was back after injury but lasted just 23 minutes. Craig Stanley was also back after injury for Morecambe as they beat Grays 1-0, while Danny Carey-Bertram was also no longer troubling the physio as he came on as a sub to join Jon Brady as Cambridge beat Tamworth 1-0. Brian Smikle was one of three attacking players thrown on as Kidderminster tried to get something out of their 1-0 loss at home to Crawley. Jamie Pitman started, and Mark Beesley made a rare subs appearance as Forest Green recorded their first win under Jimmy Harvey with a 2-1 win over Phil Robinson's (and Neil Grayson's) Stafford, while John Grant was dropped to the bench after one goal in seven for Aldershot's 0-0 draw with Altrincham. Up the divisions, Karl Hawley scored the consolation as Crewe beat Carlisle 5-1. Potential loanee Ben Rix was a late sub for Crewe. Paul Parry put the icing on the cake with the last and set up two others as Cardiff demolished Wolves 4-0, while Gavin Williams will face two months out with surgery scheduled on a troubling knee injury. Walsall's 4-0 win over Mansfield allow them to open up a three point lead at the top with Swindon only managing a 1-1 draw with Boston, who finished the game with ten men. Wycombe stay third despite losing to another last-minute goal at Accrington, while Lincoln (4th) suffered their second defeat in a week as they lost 2-0 at home to Bury. MK Dons are fifth after coming back from 3-1 down to draw 3-3 at Barnet. Notts County move above Torquay after beating them 1-0, while Jon Daly scored a hat-trick as fast improving Hartlepool (7th) beat Wrexham 3-0. Peterboro beat Stockport 1-0 thanks to a Trevor Benjamin goal, and Shrewsbury drew 1-1 at Rochdale. Chester beat Bristol Rovers 2-0 thanks to two first half goals. After todays results the Bulls are up to 13th on 16 points, just two points off the play-offs. Macclesfield are the only side with a single figure points total, and are seven points from safety at the bottom of the league. On a wet afternoon at Edgar Street Hereford United snatched a 1-0 victory against bottom side Macclesfield Town, who are yet to win a game this season. United had made one change to the side that were defeated by Bristol Rovers last Wednesday, with Andy Williams taking the place of Tim Sills up front. Much like the weather, the first half was very dull indeed with few chances for either side. It was the visitors who went closest though through an early free kick, which Wayne Brown scrambled across his line to tip around the post. Martyn Giles saw a header from Rob Purdie's corner blocked, but it fell to the impressive Alan Connell, who hit a good shot on the bounce inches off target. Both sides were able to retain possession reasonably, but neither looked like making a decisive break through. Dean Beckwith played Stuart Fleetwood away down the right channell, but he was met by 'keeper Tommy Lee in the box, and Fleetwood again made Lee work with a low effort from twenty five yards before referee Alan Wiley brought the half to a close. United opened a tad more lively, but couldn't make it count when they forced a bit of a mele inside the visitors box, before Macclesfield went close with another good free kick from Matthew Tipton. Brown had to be on his toes again as he pulled off another impressive save to keep his clean sheet in tact. The sun had shone through in the sky at the start of the second half, and it was Alan Connell who was shining on the pitch, as he picked out Fleetwood with an inch perfect through ball. Fleetwood was quickly away, through on goal, but again Lee got the better of him, rushing out and blocking the shot well. At the other end Beckwith was on hand to cover Brown the one time he was beaten, as Martin Bullock played a ball around the corner to Tipton, who shot low. Minutes later though, with just ten remaining, the deadlock was broken with a wonderful opportunist goal by Connell. United had attacked on the left, and the ball was played back to Connell twenty yards out, and he shot superbly on the turn in to the far bottom corner, beyond the reach of Lee's outstretched hand, much to the delight of all but the 143 away fans in a crowd of 2,705. Immediately after, Williams was replaced by Sills, before Connell almost doubled the advantage. Fleetwood suddenly burst into life after a quiet spell down the left, cut back to Connell who awaited on the edge of the box, but his powerful drive was deflected over by Kevin McIntyre for a coner, though Connell and Richard Rose both appealed for hand ball. Having run down the clock, the victory was almost United's, but Macclesfield had one last throw of the dice with a corner in the second added minute out of three. The ball was played in, spurring a goalmouth scramble, but eventually Brown came out and claimed well to secure the three points for his side. It is just that, the three points, that were needed by United following their recent run of defeats, but the performance was definately not what was needed. It was in general an unexciting encounter, with few chances, and on very few occasions did The Bulls look like actually scoring. This would be worrying at the best of times, but maybe even more so against the side who are bottom of the league, in front of an home crowd, and still in search of a first win of the season. HUFC: Brown, Beckwith, Mkandawire, Giles, McClenahan, Travis, Rose, Purdie, Connell, Williams, Fleetwood. Subs: Jeannin, Gulliver, Thompson, Webb, Sills. MTFC: Lee, Teague, Scott, Swailes, McNulty, Regan, Morley, Navarro, McIntyre, Tipton, Bullock. Subs: Brain, Smart, Hadfield, Miles, Heath. In a largely uninspiring game, the Bulls beat Macclesfield 1-0 thanks to a superb piece of skill from Alan Connell. A fit again Andy Williams took the place of Tim Sills, but the Bulls laboured with several players apparently lacking confidence. Alan Connell's second half goal gave Hereford United three points this afternoon in the game against Macclesfield. The win for the Bulls lifts them up to 13th in the League. However this was not a convincing performance and to have only scored one goal against the side routed at the bottom of the League shows that the Bulls still have work to do especially in mid-field. Darlington have reported this morning that their manager David Hodgson has been suspended. Neil Maddison will be charge for the present. Chairman George Houghton is to conduct an internal inquiry 'to consider a range of issues relating to the performance of the club and the background to open speculation concerning another football club's contact with the manager.' The inquiry could take up to two weeks. There is speculation that Hodgson has been linked with the manager's job at Bournemouth which is vacant since Sean O'Driscoll and ex Hereford United coach Richard O'Kelly moved to Doncaster. Darlington visit Edgar Street in two weeks time. Midfielder Kevin Cooper has joined Yeovil Town on-loan from Cardiff City. Some Hereford United supporters had seen Cooper as a possibility to bolster the Bulls midfield. 31 year-old Cooper had a minor knee operation during the summer, which has kept him out of the Bluebirds first team so far this term. City manager Dave Jones wanted him to have a spell on loan just to gain his final sharpness. Notts County manager Steve Thompson has been fined £300 and banned from the touchline for two months after being found guilty of abusing referee Danny McDermid earlier in the month. Shrewsbury have appointed a marketing manager to 'oversee commercial opportunities at the new stadium'. Torquay have signed veteran striker Leo Fortune-West on a months loan from Rushden and Diamonds. The 6ft4in forward has started just two games since arriving at Nene Park from Doncaster in the summer. Barnet midfielder Andy Hessenthaler is one of six people to be interviewed for the managers job at Bournemouth. Confusion has arisen about which games are to be free for the under 10's at Edgar Street. In the Worcester News today, Graham Turner says that the experiment starts tomorrow but the Hereford United Official Website says that it doesn't start until October 14th. "In order to attract the fans of tomorrow we have decided as an experiment to allow under 10s in free of charge when accompanied by an adult for the next three league matches," said Turner. "We hope these measures will encourage a parent to bring along the kids and get them interested in the club. "Once committed, the supporter remains a supporter for life, the fans of tomorrow are vital for the long-term future of the club." Turner also mentioned the next three matches in the Hereford Times this week. However the Official Website doesn't mention tomorrow's game and lists two forthcoming fixtures, on October 14th and 28th, when children under 10 can enter free of charge subject to conditions. The Bulls will be close to full strength, with only Andy Williams doubtful after missing the last two matches with a knee injury. Andy Ferrell and Luke Webb, both used subs in the last two games, are pushing for starting spots with the midfield still not firing on all cylinders. Macclesfield have a mystery virus in the camp which threatens the fitness of two players - who manager Brian Horton is refusing to name. Strikers Matty McNeil (groin) and on-loan Spencer Weir-Daley (ankle) have both missed the last two games and are also doubtful for Saturday, leaving three fit strikers with one goal between them all season. Best Odds: Bulls 4/5, Draw 12/5, Macclesfield 18/5. HUISA, the Hereford United Independent Supporters Association, is holding it's Annual General Meeting tomorrow at the Richmond Club just across the A49 from the football ground. HUISA say: This is an opportunity for all HUISA members to air their views on the way HUISA is being run, to view the association accounts and to offer up any suggestions and ideas for events and fund raising. The meeting is due to commence at 12.30pm and Keith Dodd is expected to be in the chair. With a home game against Macclesfield starting at 3pm, there will plenty of time for discussion. The Hereford United coach gave this view to BBC Hereford and Worcester. "We've climbed a level and anybody who thought it was just going to be all plain sailing was daft." Trewick has also spoken to the Worcester News. "After the last couple of games we have got to show a bit of character and put in a performance against Macclesfield and get a result. "We went to Wrexham, played quite well and lost and we went to Bristol, played quite well and lost. It's not a habit we want to get in to." "It was a good first-half performance where we deservedly went into the lead and could have got a second. "Apart from five or 10 minutes of the first-half we played as well as we have all season. We passed the ball quite well in the second-half. Until they scored their two goals quickly it was a satisfying performance. Two goals in such a short space of time knocked the stuffing out of us." Meanwhile Forest Green Rovers have announced that former Hereford United player Guy Ipoua has left the club as manager Jim Harvey does not see him as part of his plans and so his non contract registration has been cancelled. After Craig Hinton wanted a 1-0 win at any cost, Macclesfield manager Brian Horton is looking for a 'scrappy' 1-0 win to kickstart his club's season. Speaking after their 1-1 draw with Chester, Horton told reporters: "We've just got to keep working and get rid of the stupid mistakes. All we need to do is win a scrappy game, defend like hell for the second half and scrape it 1-0, we've got enough scrappers in the side. That's what people have to do at times, but we can't seem to do that, we always have someone who'll make a mistake. "It's happened before on set pieces this season, but we're quite a big side and things like that shouldn't be happening so often, but unfortunately they are. It's almost unacceptable that such an experienced defender can lose his man in the six yard box and he gets a free header. I have been trying to get another forward in, but it's hard trying to get strikers in at this time." Hereford United have announced details of free entry offers for under 10's at forthcoming games. The home matches with Darlington (Oct 14th) and Accrington (Oct 28th) will allow a paying adult to bring in up to two under 10's free of charge. Tickets must be purchased at least 24 hours in advance. Dean Beckwith, the Hereford United defender, spoke to BBC Hereford and Worcester after last night's game at Bristol. "First half I thought we had opportunities, they had opportunities as well. Browny made some good saves. "Second half from our point of view they were bad goals to give away. "We need to work against giving away goals like that and we need to be stronger from set pieces." The Bristol Rovers manager, Paul Trollope, seemed pleased with the outcome. "This game looked like the old story for us when we started really well and then gave away a penalty with a rash challenge. There were harsh words at half-time, but the players responded superbly." The Bulls will entertain Macclesfield, the side that replaced them in the league back in 1997, for the first time on Saturday. There has only been one encounter between the sides, in last season's LDV Trophy. Macclesfield won that game 2-0 thanks to two first half goals, with just seven of the sixteen named by the Bulls that night still with the club. The Bulls home form seems to be the only thing holding them in a respectable league position. One point from five away games has been contrasted with nine points from the same amount of home games. Defensive frailities, especially from set pieces, have been blamed for many of the conceded goals this season and Graham Turner will have to work hard to eliminate the mistakes that have cost the Bulls dearly in the last two games. Macclesfield were lucky to start the season after being handed a massive fine over the misappropriation of grants for stadium work, but they have failed to win yet this season, gathering just four points. A mirror image of the Bulls form has seen them net a single point from five away games so far this season. They are believed to be operating on one of the smallest budgets in the league and their bottom of the table status is a surprise to few. Hereford United vs Macclesfield Town, Edgar Street, Saturday September 30th, 3.00pm. Darlington striker Julian Joachim will miss their trip to Edgar Street on October 14th after being ruled out for a month with a hamstring problem. Joachim, who has scored five times in ten games since a six figure move from Boston, was withdrawn at half time in Tuesday's 1-0 loss to Mansfield with scans later revealing the extent of the damage. In other news, Boston boss Steve Evans has told reporters that he will quit at Christmas if results do not improve, but he may not get the opportunity to wait that long with sentencing on his fraud trial due in early November. After a bright opening during which they took a deserved lead through a Rob Purdie penalty Hereford succumbed to two quick fire goals in a lacklustre second half at The Memorial Stadium on Wednesday evening. The Bulls, as they did at Wrexham on Sunday, made an enterprising start with a team showing the return of Trent McLenahan to the right side. Simon Travis reverted to the left of a five-man midfield with Alex Jeannin dropping to the bench. After the initial skirmishes United settled to their task and produced some neat passing movements at a good tempo. In the tenth minute, a Travis though ball found Tim Sills on the edge of the box but his weighted lay-off was blazed high and wide by the advancing Richard Rose. A couple of typical surging runs from Fleetwood produced stops from Rovers keeper Philips including one which was tipped over the bar only for the referee to mysteriously award a goal kick. The use of Alan Connell in a role behind the front two looked good as Purdie found him often with balls played in to feet enabling him to feed the wide players. It was this type of move which produced the opening goal when, as the ball was fed wide to Trent McLenahan as he advanced into the box, he was brought down by Aaron Lestcot. The resulting penalty was despatched hard and low into the left corner of the goal by Rob Purdie to give the Bulls a well-earned lead in the 17th minute. Bristol responded with good efforts from Walker including one, which produced a superb save by Wayne Brown. Bristol had conceded a string of free kicks and it came as a surprise when referee Taylor issued a yellow to McLenahan on the stroke of half time for only his second infringement of the game. Although Rovers showed a few warnings towards the end of the half, Hereford looked reasonably comfortable with their 1-0 half time lead. As ex Bull Ryan Green left the field for his orange he was treated to chorus of "One Nil to the smaller team" by the vocal travelling fans, which seemed to bring a smile from boss Graham Turner. As the second half progressed United seemed to drop deeper and the passing game deserted them. Rovers midfield began to get the upper hand as their Hereford counterparts stood off. The Bulls had a let off in the 51st minute when a Richard Walker shot from the edge of the box clipped the crossbar. By the hour mark, Bristol had firmly taken the upper hand winning most of the midfield battle and picking up the lions share of the second ball as Hereford struggled to keep their composure. Rovers introduced James Walker as a tactical replacement for Lewis Haldane as they searched for an equaliser and within five minutes his assist from just inside the box allowed Richard Walker to fire home a left footed volley from 12 yards. Within a minute, Walker had given Rovers the lead when he met an Aaron Lescot cross in the six-yard box and forced the ball home. With just over twenty minutes remaining, Bulls fans were wondering what had happened to the neat controlled football of the first half as the team looked drained of confidence, ideas and stamina. With fifteen minutes left on the clock Turner replaced Connell with youngster Luke Webb and Rob Purdie with Andy Ferrell in an attempt the give life to a flagging United midfield. As the cause became more desperate Turner, who appeared to be alone in the technical area, even threw captain Mkandawire into the front line without getting the desired effect. At the end, The Bulls looked a beaten team baring no resemblance to the outfit that had started so well against a nervous Bristol Rovers. Once again we failed to gain much benefit from the ariel strengths of Tim Sills despite the noble efforts of McLenahan to provide a service. The usual hard working display from Simon Travis was hampered by his need to check back before delivering crosses that frequently curled too close to the keeper rather than creating opportunities for goal bound headers. Maybe the time has come to utilise a pair of strikers who rely on pace and skill rather than height. Stuart Fleetwood seemed to lose the will to chase towards the latter periods and needs to share the workload. Turner will no doubt be hoping that the injured Andy Williams reports fit in time for the "must win" game on Saturday. Hereford United were defeated 2-1 by Bristol Rovers this evening. The Bulls took the lead through a Rob Purdie penalty but Rovers replied in the second half with two goals in around a minute, both scored by Richard Walker. Not for the first time this season Hereford United were outplayed for much of the game especially after going ahead. The stats for the game show Hereford only had two shots on target. Hereford stay in 15th place in the League and have only taken one point away since the opening game at Stockport. Potential loan signing Ben Rix played the full game last night as Crewe lost to Swansea in League One. With a string of midfielders injured, Rix was thrust into action for his first league start of the season. In other news ex-Bull Michael Husbands, who made five sub appearances at Edgar Street in early 2003, scored after 17 seconds but was later sent off by Slop referee Rob Lewis for serious foul play in Port Vale's 1-1 draw with Nottm Forest. Bristol Rovers defender Craig Hinton, who will make his 100th Rovers appearance tonight, is looking for a result more than a performance. Speaking to the Western Daily Press, Hinton told the reporter: "We just need to take the points tonight no matter what. Hereford can batter us for 89 minutes, but if we win 1-0 then we'll take that. Ultimately it's points that matter. You can play all the nice football in the world, but if you can't get the results then it doesn't mean anything." The WDP also reports that head coach Paul Trollope will mull over several changes before tonights kick off, with on-loan striker James Walker likely to feature and captain James Hunt likely to be recalled after suspension. The paper also quotes Graham Turner, who watched Rovers lose on Saturday, as saying: "Rovers had a lot of the play but got done by a couple of set-pieces. Despite their league position, they are not a bad side. They have just spent £200,000 on a striker and have Ryan Green down there, so we know the quality of their players." Grimsby have signed Stevenage striker Tony Thorpe on a months loan. The 32 year old started just one game after a summer move to Broadhall Way and spent last season with Colchester and Swindon, scoring once in 13 starts. Walsall have signed much travelled keeper Bertrand Bossu on a free transfer until the end of the season. The giant French stopper has had a dozen clubs since entering English football with Barnet in 2000. Crawley's owners have accepted an offer for the club from Britannia Sports Management. BSM are one of a group of companies controlled by Matthew Pearson, who missed the Administrators' deadline for bids in August. Details of the bid are vague, but the deal is hoped to be completed next week. Exeter have agreed an undisclosed compensation fee with Tottenham for former manager Alex Inglethorpe. Inglethorpe left in the summer for a youth coaching role at White Hart Lane after twice missing the play-offs. The Non-League Paper is reporting that Dagenham are considering sueing the FA after both Steve Evans and then-chairman Pat Malkinshaw admitted fraud charges in relation to their 2002 Conference winning season. The club have always believed that Boston should never have been allowed into the league after the fraud was discovered shortly after the end of that season. Oxford have announced the sale of their 3,000th season ticket this season. The figure is up 700 on last season's total. Walsall remain top of the division after a 1-1 draw at Shrewsbury. Second placed Lincoln play tonight and can take the top spot with a win. Wycombe (3rd) and Swindon (4th) drew 1-1 at Adams Park after a last-minute Tommy Mooney equaliser. MK Dons (5th) came from two down at half time to beat Torquay (7th) 3-2. Izale McLeod and Jamie Ward both bagged two goals apiece. Notts County beat Stockport 1-0 to remain 6th. Darlington lost 1-0 to Mansfield, and Hartlepool beat Grimsby 4-1. Accrington's 2-2 draw at Bury moved them above the Bulls on goal difference, while Peterboro drew with Barnet 1-1, while Bottom side - and Saturday's opponents - Macclesfield drew with Chester 1-1 after leading for half the game. Wrexham vs Rochdale, Boston vs Lincoln, Bristol Rovers vs Hereford United. Bristol Rovers have signed a young striker from Charlton for a month. James Walker, who is an English Under-19 player, is expected go into the Rovers squad against Hereford United tomorrow evening. He will link up with his new team-mates tomorrow. Meanwhile after tonight's League Two games Hereford United have dropped to 15th position in the League. Bristol Rovers are now down to 21st place. However should the Bulls win tomorrow they could move up to 9th position. Andy Williams is rated as a doubt for tomorrow's game at Bristol Rovers according to the Worcester News. He has a knee injury and Graham Turner is reported as saying he does not think he will be fit to face his suitors. As regards the game, Turner hoped that the Bulls would perform as they did in the first half against Wrexham. "We created one or two opportunities against them. I was reasonably pleased. "If we repeat that performance we will win games. "We should have scored but we were a little bit sloppy at set-pieces, one of which proved costly. But we have been working at putting that right in training." Turner watched Rovers against Walsall last Saturday. "I think they have got some useful players and although they are in the bottom half of the table I think they can be formidable opponents for anybody in this league." Ryan Green, now with Bristol Rovers, has told the Bristol press that Hereford United have several useful players. "They have pace up front in Stuart Fleetwood, who will be a danger man," said Green. "Andy Williams is a very good player too, which is why we're interested in him, while Tim Sills is their target man. "Tamika Mkandawire is one of the best central defenders in the league and I think both he and Fleetwood could play in the Championship." Boston "Cheated For Four Years"
Boston United cheated the Inland Revenue with illegal payments to players for at least four years - but claim it was to keep the club afloat. At the High Court trial for five men, including current manager Steve Evans and former Chairman Pat Malkinshaw, the IR believe that at least £323,000 was withheld from them as a result of the illegal payments, dating back to 1997, suggesting that around £1million of illegal payments were made. At the time the scam started, Boston were fighting against relegation from the Unibond league. Four years later, when the scam was uncovered, it has gained two promotions into the Football League and gates had risen ten-fold. Proscecuting QC Martin Hicks told the Court: "The method deployed was simple - wages to various players and staff which attract tax were disguised as out-of-pocket expenses which do not attract tax. Various fees and bonuses, such as signing on fees or winning bonuses, went undisclosed when they should have been declared. "The motive for the cheating was not one of personal greed. At the time the club was going through financial difficulties and was at risk of going under. By depriving the Revenue of tax and national insurance contribution due, the club was able to prop up what you may decide was an ailing business. "By concealing the true extent of the payments to players and staff, the club could afford to falsely inflate its budget and attract players who would otherwise be beyond its grasp." The case is expected to last six weeks. Ryan Green has told the official Bristol Rovers website that tomorrow's clash with Hereford United will be a big game for him. It will be the first time Green has faced his former club since leaving Edgar Street. "It's a big game for me, and I'm sure there will be lots of memories coming back," said Green. "I hope I get a good reception from their fans, I had some good times with them, although you never know maybe there'll be one or two boos. "I spent three years at the club, and they were three very enjoyable years too. But I think this is a bigger club and it was time to move on for me. "Although I'm looking forward to the game for obvious reasons, the main thing is getting the right result. We need the three points, and that's what we're focussed on getting. "Although I wish Hereford all the best this season, I'm a Bristol Rovers player now I hope we can take the points off them tomorrow night. "They've done well since they've been promoted, and to be fair I always thought they would do. "They've got some good players there, plenty of pace up front, and some very good defenders at the back. I think they will finish at least mid-table, and good luck to them. "Tomorrow I think will be a good game of football to watch, they are a passing team similar to ourselves, and they like to get the ball down and play. "It's a match we know we desperately need to take the points from, and although I wish Hereford all the best this season, I'm a Bristol Rovers player now I hope we can take the points off them tomorrow night." At the recent fans forum, Graham Turner contrasted the departure of Green with that of Craig Mawson who is now with Halifax. Turner praised Mawson for his time at Hereford and his integrity in keeping Turner informed when he left Edgar Street. Turner didn't have the same kind words for Green. BBC Hereford and Worcester have announced that they will have full commentary from tomorrow's Hereford United League Two game at Bristol Rovers. One of the features in the excellent Wrexham programme from the Racecourse on Sunday was a look back at a match programme from the past. They featured the programme from the Hereford United/Wrexham Welsh Cup game played at Edgar Street on Thursday April 18th 1963. The Bulls won the game 2-1 with a crowd of 3354. The programme published by the Hereford United Supporters Club cost 3d or just over 1p in today's money and was a 12 page issue. At the time Mr Len Weston was chairman of Hereford United and Mr F.J Spiers was vice-chairman. Ray Daniels was Player/Manager. Some of the advertisers included Weston Cider, the Sunday Express, Cafe Ascari and Wyelands Caravans. The notes were written by F J Turner who was the secretary at Edgar Street. "We shall no doubt start second favourites on the book but our boys are often in the humour to pull out all the stops when facing tough opposition. "We can therefore look forward to a very entertaining game and hope that our boys can give us yet another of those welcome surprises." The Football League has released the names of the referees for the next two Hereford United games. Anthony Taylor of Cheshire will be in charge at the Memorial Stadium for Wednesday's game with Bristol Rovers. On Saturday, when Macclesfield are the visitors to Edgar Street, Alan Wiley will be the man in the middle. "There has been interest, we've never denied that," Trollope told bristolrovers.co.uk. "He is a player that interests us, but at the minute nothing is happening on that front. "We missed a few targets during the summer and into pre-season, and he has been well up on that list for that period of time. "It's something we've looked at, and there have been discussions. But at the moment all we can say really is that it's an ongoing situation." Trollope has also spoken about his club's present position in the League. "We know that Hereford is a big game for us, and we need the three points. If we can get them then the world will be a much rosier place and we can starting looking upwards. "We've had Hereford watched and I've seen them play, and they've come up from the Conference and got some decent results. They have a few front men capable of scoring, but I am confident that if we work hard and keep our minds focused then we will be ok."
Former Hereford winger Paul Parry has been included in John Toshack's Wales squad for the upcoming European Championship Qualifiers against Slovakia and Cyprus. Parry missed out last time round for Wales after picking up an injury. There is no place in the side for Gavin Williams. Wrexham also have two players in the national side in Ryan Valentine and Mark Jones, both who featured yesterday against The Bulls at The Racecourse. The Bulls' youth side lost 5-3 to Oxford on Saturday, after being 3-0 up at half time. The three first half goals were their first of the campaign after conceding 27 goals without reply in their first five games. Speaking in the Western Daily Press, Bristol Rovers head coach Paul Trollope was disappointed by Saturday's result and bemoaned his side's defence and forwards: "We'd identified it as a big game after a number of draws but didn't get anything from it after another couple of catastrophic defending errors. I'm fed up of saying it, but we had some decent play in between the penalty boxes but lacked hugely in their area. It's not acceptable and we've said it too many times. "Now things have to change quickly - our personnel and our thinking. It can't happen again because the league position we are in doesn't lie. Is it bad luck or a lack of quality? I'm beginning to think we lack quality in vital areas of the pitch, which is our third and their third." The Bulls travel to the Memorial Ground for the first time since Rovers moved into the stadium in 1996 after an eleven year stay at Bath's Twerton Park. Despite the rivalry, it's 19 years since the two sides last met in a League Cup two-legged encounter with Rovers winning the match at Twerton Park 1-0, but the Bulls won the return leg 2-0 to edge past the higher graded side. It's nearly 30 years since a league encounter, with Rovers failing to beat the Bulls in four attempts in the league. A 1-1 draw at Edgar Street in April 1977 in what is now League One being the last league meeting. The Bulls will look to improve on a recent run of just one win in the last six games. A more controlled performance against Wrexham failed to have an end product attached to it and a defeat to Rovers will see the Bulls slip into the bottom half of the table. Rovers have been described by their manager as unlucky or just plain awful in recent weeks as they have gone five matches without a win. Despite spending £200,000 on Rochdale striker Rickie Lambert they have struggled to find the net with consistency, failing to find the net more than once in any game this season. Bristol Rovers vs Hereford United, Memorial Ground, Wednesday September 27th, 7.45pm. Speculation that Ben Rix is coming to Hereford on-loan from Crewe looks less likely this lunchtime. Crewe still have serious injury problems and Rix is likely to be on the bench against Swansea in their midweek game. Meanwhile the Western Daily Press appears short of material today as they are once again talking of a possible transfer of Andy Williams from Edgar Street to Bristol Rovers. However there are no direct quotes naming Williams. Hereford United play their next fixture against Bristol Rovers on Wednesday evening. Hot on the heels of Sunday's trip to Wrexham, the Bulls find themselves making another relatively short journey to Bristol on Wednesday evening. Leave the M5 at junction 16 and join the A38 (south) towards Bristol City Centre. The stadium is about 5 miles from junction 16. Stay on ther A38 passing the British Aerospace Works and look for the Royal George and Duke of York pubs. At the next lights, you will see the Memorial Stadium signposted to the left and the ground is just a hundred yards or so down this road. Parking is mostly in the streets around the stadium. Once again, train travel looks a "no-go" as the return journey does not get into Hereford until 01.36! An earlybird discount of £2 can be obtained by buying tickets from HUFC main office before 4.00pm on Tuesday afternoon. Refreshments - Best bet looks to be the Inn on the Green opposite the Sports Centre on the main road. The Wellington, on the corner by the traffic lights will often take "visitors" although it is normally a Home pub whilst the Victoria is about a 100 yards down the Gloucester Road. The Annexe Inn is listed in "The Good Book" and often serves up to 8 real ales. It can be found in Nevil Road by following signs for the County Cricket Ground. We are due a win! The Red Dragons had been boosted by the return of highly-rated left-sided midfielder Matt Done and former Darlington defender Ryan Valentine - but skipper Neil Roberts and central destroyer Shaun Pejic failed early-morning fitness tests. The Bulls made two changes to the side dumped out of the Carling Cup at Edgar Street in midweek - former Torquay goal poacher Alan Connell and Frenchman Alex Jeannin coming in for the injured Andy Williams and banned Trent McClenahan. Just 80 miles separated the rivals, and this derby ignited from kick-off as Hereford, backed by a 700-strong following, began a ferocious opening assault. The Red Dragons, had shipped 10 goals in just over two hours of league soccer. And defensive frailties were showing once more as towering Dean Beckwith powered Jeannin's delivery over in the fourth minute. Jittery Wrexham wobbled again on 12 minutes. Retreating Valentine was totally skinned by Rob Purdie - the schemer's curling cross bravely punched clear by keeper Michael Ingham as Tim Sills roared in. Home anxiety increased in the moments that followed. Blond-haired Connell had Evans and Danny Williams seemingly mesmerised, but spun to pull wide from eight yards. The Bulls must have rued their wastefulness as embattled Wrexham smuggled a critical lead. United's Simon Travis has initially cleared John McAliskey's flick from the goal line. But the ex-Telford man was unable to repeat his heroics seconds later as Evans reaped maximum return from another Darren Ferguson corner. Yet stunned Hereford will wonder why they weren't level in this entertaining collision. Midfielder Richard Rose fizzed a low drive inches wide and the raging Bulls claimed Ingham had clawed Sills' header back from behind his goal angle. The Red Dragons were, though, so unfortunate not to have doubled their lead near the break. Valentine's menacing ball was just deflected to safety by a stretching Tamika Mkandawire and only Travis' last-ditch intervention thwarted McAliskey. Wrexham's determination was always evident throughout a tense second half. The swashbuckling Done was fractionally wide with a 30-yard rocket and Mark Jones went close. But Stuart Fleetwood almost stole a late reward for the visitors - just off-target from close range. Interviewed for Sky Sports, Graham Turner seemed quite pleased with his side's performance today. "Magnificent ground, one or two experienced players in there," said the Hereford United manager. "I've got to make sure the lads aren't too down because we've had some poor performances and I've had a go at them. "But today they've worked hard." Hereford United only managed three shots on target this afternoon including the one from Tim Sills that hit the bar. The statistics show a game of few scoring chances for either side - Wrexham were credited with five on target goal attempts. Although Rose and Beckwith were booked, Hereford only had eight fouls against 16 by Wrexham. Simon Travis was given an eight and Giles, Connell, Beckwith and Brown all received a seven. 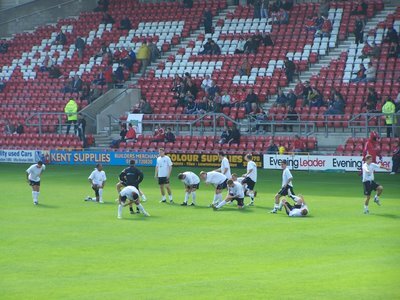 Most of the squad warming up before the game. Meanwhile Wrexham manager Denis Smith seemed releived that his side had got back to winning ways. "You're never comfortable at 1-0 and I thought that they didn't look as though they were going to score but you never know. Its always one of those where something can bounce around and in off any part of anyone's body so I would have been happier if we had got a second. It would have relieved my nerves, but we didn't really look as dangerous in the second half as we did in the first, " commented Smith. Hereford United have dropped one place to twelvth position in the League Two table. Finally 663 Hereford fans watched the game. 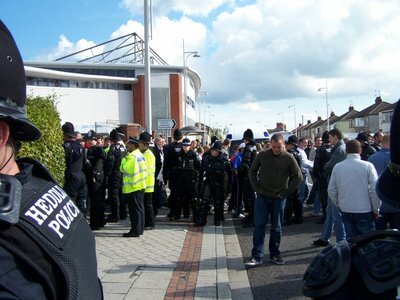 Police were out in numbers as around 600 Hereford United supporters left the Racecourse this afternoon. As there was only one way out supporters couldn't help being filmed and scrutinized by the North Wales force. Fans were made to walk around a cordon of police. Several were picked out and kept within the cordon. Police refused to reveal the purpose of the exercise. Hereford United suffered another dissapointing result on the road as they went down by a single goal at The Racecourse. Steve Evans headed home the only goal of the game in the first half to condemn Hereford to their second straight defeat on the road. Andy Williams was missing for the Bulls after failing to recover from his injury in time for today's encounter, Alan Connell replaced the young striker. Alex Jeannin was also recalled to start at left full back as Graham Turner continued to try out the 5-3-2 formation. Recent signing Luke Webb was handed a place on the bench. Wrexham started the half brightly and a decent run by left back Ryan Valentine ended in a long range effort going narrowly wide of Wayne Brown's post whilst at the other end, Martyn Giles missed a close range header after a Jeannin free-kick. Evans then headed over after a good cross from the left hand side. The first half was entertaining with both sides working hard, and playing some quick football. Stuart Fleetwood hunted down the ball and stopped it from going out before running into the box, despite a better option of laying the ball off to Connell, the Welsh Under 21 striker shot, only to see his effort blocked. The rebound fell to Connell, who could only fire wide. Yet Wrexham's aerial pressure paid off in the 28th minute when Evans scored. A minute earlier, United had a warning after John McAliskey header goalwards only to see his effort cleared off the line by Simon Travis. Despite this, soon after, a cross was sent in goalwards and former TNS defender Evans powerfully headed past the helpless Brown. At first though, the ref failed to give the goal after Travis had cleared again, but the linesman signalled that the ball was over the line and the Welsh side went in front. Chris Llewellyn tried his luck from all of 50 yards after spotting Brown off his line, but his effort, maybe influenced by Xabi Alonso's stunner against Newcastle in mid-week, was far from troubling the former Chester number one. Jeannin provided good width down the left hand side for United, and, on occasions looked a real threat. His cross was deflected out to Richard Rose, who dummied before shooting wide. Brown was called into action once again to stop a deflected Matty Done effort. Hereford's best chance of an equaliser came towards the end of the half, when Jeannin crossed from the right hand side. Tim Sills rose above the rest but his header didn't have the beating of Mike Ingham in the Wrexham goal, as he tipped the ball onto the bar, before a clearence was made. Mark Jones' determined run on the right hand side created an opening for himself, but his eventual shot was weak and straight at Brown. Once again, it was a case of being in the right place at the right time as United's failure to defend set-pieces nearly cost them dear once again. Travis was on the line, to head away a powerful effort by McAliskey. The final talking point of the half came immediately after as Fleetwood broke from his own half. His pace took him past three defenders, before he was fouled, yet Fleetwood continued. It looked as though Fleetwood could keep on running and get in a decent goal effort, but the ref pulled play back, a decision which annoyed the away following of around 600. The resulting free-kick came to nothing. The second half didn't live up to high standards of entertainment provided in the first half. Done's individual effort saw him smash the ball wide of Brown's near post. At the other end, Fleetwood tried, but failed to equalise from a 25 yard free-kick. Jeannin and Giles got in a mix up down the left hand side, as neither failed to make a challenge on Jones, but the Welshman's effort was wild and far from troubling Brown. Turner decided to change it, as Connell was replaced by Ferrell. The former Watford youngster nearly made an instant impact with a half volley, but Ingham held on. Matt Crowell the hit a shot past the post, before United won another free-kick in a dangerous position. Fleetwood took it once more, and curled it around the wall but the ball flew just past the top corner. There was a debut for Webb, as he replaced Richard Rose in the latter stages but it was to no avail as Tamika Mkandawire wasted a valuable late chance for Hereford. Purdie struck a low corner, and after a flick on, the Hereford captain poked the ball wide off the post, if the shot had been on target, the ball would more than certainly of gone in and sealed a point. But it wasn't to be as United went down for their third away defeat of the season. 4705 supporters were at The Racecourse for the early kick-off which saw Wrexham bounce back after poor recent results. Hereford played some good football but in the first half, but failed to match that performance in the second. One will hope that United now step it up in order to come back from Bristol Rovers on Wednesday with at least a point. Hereford: Brown, Travis, Jeannin, Beckwith, Mkandawire, Giles, Purdie, Rose, Connell, Sills, Fleetwood. Subs: Thompson, Gulliver, Ferrell, Wallis, Webb. Wrexham: Ingham, Roche, Valentine, Evans, Williams, Jones, Crowell, Done, Ferguson, Llewellyn, McAliskey. Subs: Jones, Williams, Spender, Johnson, Newby. The Bulls lost 1-0 to Wrexham in today's lunchtime kick off match. A first half Steve Evans goal was enough to seperate the sides as the Bulls struggled to get shots on target, blazing wide on several occasions. Hereford United captain, Tamika Mkandawire, has told the Western Daily Press that Wrexham may have lost their confidence after losing their last three goals and letting in 14 goals. "Their confidence will have taken a bit of a battering after conceding so many goals," he said. "But all three defeats were away from home so we will have to make sure we are not victims of a backlash. "Their manager will no doubt have them fired up for the match at The Racecourse Ground. "Our away form hasn't been as good as we would have liked but we aim to improve that against Wrexham and Bristol Rovers in the next few days. "After losing to Mansfield and Wycombe it was a very important win when we beat Bury last Saturday to move back into the top half of the table." Jamie Pitman scored his first goal in 33 games since netting for the Bulls at Kidderminster last October to salvage a point for Forest Green in their 2-2 draw with Craig Mawson's Halifax. Craig Stanley was an injured absentee from Morecambe's side as they were beaten 1-0 at home by Kidderminster. 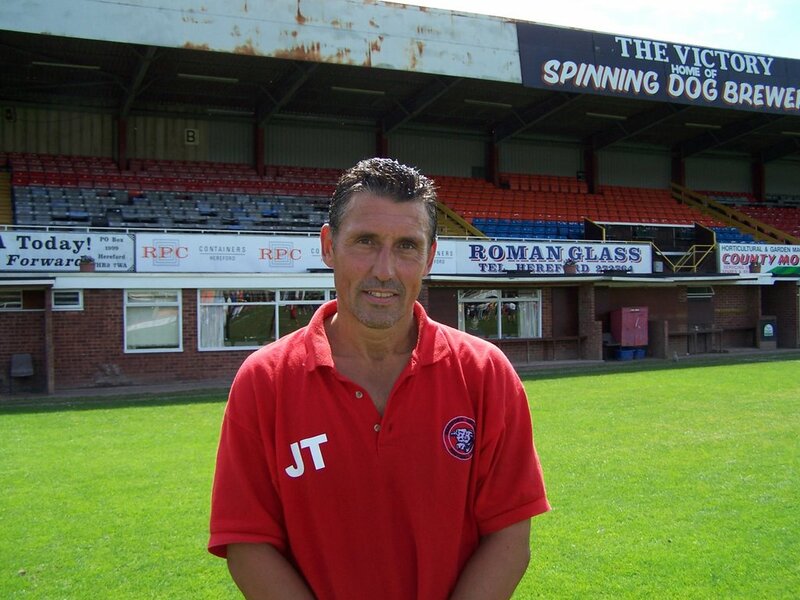 Ben Smith scored and was booked as 10-man Weymouth, without an injured Tony James again, lost 4-1 to Dagenham. Gavin Mahon was booked as Watford drew 1-1 at Wigan. Steve Guinan might want to have words with his best mate John Finnegan after Guinan was sacrificed after half an hour following Finnegan's dismissal at home to Bradford. Cheltenham lost 2-1. Walsall are top of the league on goal difference after a 2-1 win over Wednesday's opponents Bristol Rovers. Lincoln are second after a 3-1 win over previous leaders Wycombe (3rd), which ended their eight match winning run. Swindon slip to fourth after a 1-1 draw at Notts County (6th), while MK Dons had a surprise home loss to Chester 2-1. That is Chester's first win in nine games. Torquay are seventh after twice holding the lead in a 3-3 draw with bottom club Macclesfield who remain the only side without a win. Shrewsbury and Darlington are 8th and 9th respectively after a 2-2 draw between the sides at Gay Meadow. Peterboro slip to 10th after a 5-3 loss to Hartlepool, who were 4-0 up at one stage. With the Bulls in 11th, Accrington round out the top half with a 2-2 draw at Mansfield. Down the bottom, Rochdale hand Boston their place in the drop zone after beating them 3-0, Bury drew 2-2 with Barnet - on-loan Glynn Hurst scoring both Bury goals, and Stockport beat Grimsby 1-0 to move above them on goal difference. Today's results leave the Bulls in 11th. A win tomorrow would move them up to 8th, but a defeat would see Wrexham leapfrog their opponents. Hereford United have been handed a home draw in the Johnstone's Paint Trophy against rivals Shrewsbury Town. The match will take place in the week commencing 16th October. The Football League has announced more details about this seasons Johnstone's Paint Trophy. The Trophy will only be for League One and Two clubs. There will be measures to try and encourage more families to attend including free tickets for children under 16 when accompanied by a paying adult. Extra time has been scrapped for this competition. If scores are level at the end of 90 minutes, then a penalty shoot-out will decide the winner. This will avoid very late finishes to matches. Clubs will have to field a side which incudes at least six players that have appeared most often in first team games this season. The total prize fund is £350,000. Winners of matches will receive prize money and the trophy winner will receive over £90,000. Finally, as reported here earlier today, for the opening round of the competition teams are locally matched. For the second round winning clubs will be put in either a Southern or Northern section. Round One games will take place in the week commencing October 16th with the draw tomorrow (Saturday) at 9.30am on Sky. Darren Ferguson has told the Wrexham Leader that his side need to get back to winning ways after three away defeats. "I am looking forward to Sunday - it is a big game. "We were a lot better on Tuesday at Birmingham, we looked more solid and gave a good account of ourselves, and that was pleasing after two defeats. I thought it was going to go to penalties and 4-1 was not a true reflection. "We coped with Birmingham and had played well enough to win it in normal time. We had two heavy defeats in the league but no-one is panicking. No-one was getting carried away when we had such a good start to the season so it works both ways. "It is a young squad and you need experience. But the young lads have coped well." Manager Denys Smith is hoping to have a few more players to choose from for Sunday. "It is looking more positive, I will have players back and a different type of selection problem. The lads will be in for training tomorrow and we'll see who we've got. But I am hoping to be in a better state than the last three games when we have had a lot of injuries." Meanwhile John Trewick, talking to BBC Hereford and Worcester, said that as Wrexham have injury concerns ahead of the game it is difficult to know who will play and in what formation. "They have changed one or two things, so what the team will be against us, I'm not too sure," said the Hereford United coach. "But, like any game, it's about what we do; it's our approach. "It's about concentrating on our own performance, and, if we can get that right, no matter what the opposition do, we'll be ok."
There will be parking for Hereford Supporters travelling to the Racecourse at the approach to the Stadium on the grounds of the adjacent college - NEWI. Hereford United weren't the only club after Phil Gulliver pre-season. The Darlington manager, David Hogson, has said that he considered signing him in the summer. Gulliver who comes from Barnard Castle left Rushden and Diamonds and joined Hereford where he has started just four of nine league games. "I know Phil very well from his time at Middlesbrough and he's a local lad but he's not one that we're looking at the minute," said Hogson according to the Northern Echo. "He is a player we thought about in the summer but Hereford United had been chasing him for a long time and offered him an unbelievable deal. "That is not to say that we would not look at him in the future. He is very strong in the air and I can see him becoming a Neil Aspin or Steve Tutill-type player." Hereford United have been put in a small section of clubs from the Southern Section West for the first round of the Johnstone's Paint Trophy which has taken over from the LDV trophy. Southern Section (West): Bristol Rovers, Hereford, Shrewsbury, Swansea, Swindon, Torquay, Walsall, Wycombe. Hereford will find out tomorrow who they will meet. According to BBC Sport sixteen teams have been given byes for the first round of the Johnstone's Paint Trophy, which is competed for by the 48 League One and League Two clubs. Unlike the last few seasons, Conference National teams are not involved. The 32 teams not receiving byes have been split into four geographical sections for the first round - for which the full draw is on Saturday. Once the 48 clubs were divided into northern and southern sections, a preliminary draw took place last Friday which saw eight teams from each section drawn out to receive byes. The four geographical sections were then determined from the remaining 16 northern and 16 southern teams. Swansea are the holders after beating Carlisle 2-1 in last season's final at Cardiff's Millennium Stadium. There are two more reasons to watch Soccer AM tomorrow on Sky Sports 1. Alongside the Johnstone Paints Trophy draw will be a group of Bulls supporters filling the 'Luther Blissett Stand'. The programme starts at 9am. Wrexham manager Denis Smith was not shy to spell out his team's woes to the press this week: "We've got major, major problems. A week a go everyone was telling us we were the best team in the league, but all at once we are the worst team in the league and we look it. "But it's early days yet and I won't get carried away, even though I have never had this situation before. I'm not going to rant and rave at the players, instead we'll sit down and explain what's going wrong. If we can't do that we will have to change the personnel, either at the top or the bottom because theclub has got to go forward this season. But I won't panic because that does not help." Wrexham have been missing several key players including Shaun Pejic, the son of ex-Bull Mel who remains as physio of the Welsh side, as their form has nosedived. In their last league match, four players made their league debuts such was the extent of their injury problems. According to Sky Sports, Crewe midfielder Ben Rix is close to joining Hereford on loan. Meanwhile, Gradi has confirmed that he will allow Ben Rix to move to Hereford on loan once he has Tony Grant and Lee Bell back from injury. "Ben Rix wants to go on loan to Hereford, but he can't until Grant and Bell are available again," he added. Rix is a 22 year old midfielder who signed with Crewe as a trainee in 2001. He has spent time on loan at Scarborough and more recently at Bournemouth where he made 11 appearances over his three months stay. His latest appearance for Crewe was on Tuesday evening when he came on as a sub late in the game in which Crewe defeated Wigan 2-0. At the Fans Forum last Monday Graham Turner spoke about a player who was going to join Hereford United but was kept by his club for injury cover. It seems possible that Ben Rix was that player. There are slight doubts about the fitness of both Stuart Fleetwood and Andy Williams for Sunday's game at Wrexham according to the Worcester News. Both picked up knocks during Tuesday's game against Leicester. Fleetwood left the field but returned after the game. Neither injury is thought to be serious. The paper has spoken to Hereford United coach John Trewick who talked about the game on Sunday. He noted that Wrexham had lost several games lately. "Wrexham are a decent side but they have conceded in recent matches," he commented. "But I look at things from the other way and common sense tells you that's not going to happen every week. "The first thing they will want is a clean sheet to get back on track. "We are not under any illusions that we will turn up and score four or five goals because that will not happen. "It's a game we want to go and win and our attitude has to be professional." Trewick appeared pleased with the performance on Tuesday. "We can take a lot from Tuesday's game because for 20 to 25 minutes in the second-half we dominated the game. "Their 'keeper made several good saves and really we should have taken the lead. But for their goalkeeper we would have done. "It's a little bit annoying because their 'keeper shouldn't have been on the field. We felt a little bit hard done by. I can't understand why the referee made the decisions the way he did." Because of the early start the squad are travelling to North Wales late on Saturday. "Normally going to Wrexham we wouldn't have an overnight stay because it would be a 3pm kick-off. "Because it's at 12pm we just haven't got time to go up, so for us it's an overnight stay so it does change our preparation for the game." Bury have signed Shrewsbury striker Glynn Hurst on a months loan in the hope of solving their goalscoring problems. The Shakers have failed to score in each of their last four games - going down 1-0 in every encounter. Meanwhile, their veteran goalkeeper Alan Fettis will be sidelined for a few months after breaking an arm in Tuesday's defeat to Sheff Utd. Chester are trialling teenage ex-Liverpool trainee James Frayne in the latest effort to solve their striker crisis. Frayne, a nephew of England keeper David James, left Anfield in the summer. Stockport have signed Yeovil winger David Poole on a months loan, and are giving a trial to former Preston midfielder Michael Brown. Swindon are set to face a battle to keep manager Dennis Wise after the diminutive star came top of a fans poll for Leeds new manager. The Racecourse has been the home of Wrexham Football Club since it was founded in 1872. Proudly advertised on their website as "North Wales' Premier Sporting Venue", it has an attendance record of 34,445 for a 1952 fourth round FA Cup game against Manchester United. It is now a 15,500 mostly seated stadium with only terracing available in the Home "kop" end. Notable managers over the years have included Jack Rowley, Arfon Griffiths, Brian Flynn and, of course, Dixie McNeil whilst the club are currently led by Dennis Smith. Visiting fans are accommodated in the Eric Roberts (Builders) Stand which is all seated. It is likely that Bulls supporters will be put in the Upper tier which offers a good view of the pitch. Admission is £16 for adults and £5 for juniors (U16) with our senior fans being charged £10. Directions: - A49 north towards Slopbury. At the Baileys Garden Centre roundabout take the A5 sign Oswestry. As you approach Oswestry, stay on the A5 following signs for Wrexham. From Ruabon the road becomes the A483. Stay on this road as it is also the Wrexham by-pass. Continue until you reach the Mold (A541) junction. Follow signs for Wrexham Town Centre and the Football Stadium will become visible after some 300 yards. Parking is mainly in the streets although I understand the local school/college is also available. Distance is about 80 miles. For those with Sat. Nav. the post code is LL11 2AH. Wrexham Train Station is next to the ground. However, this does not appear to be an option as the earliest train arrives an hour after KO! Alehouses: - The twelve noon kick-off this is not likely to allow a lot of pre-match drinking time, which is a pity because Wrexham is reputed to have the highest Pubs to population ratio in the UK! Nearest is probably the "Plas Coch" which is on the nearby Retail Park just passed Homebase. Also fairly close to the ground is "The Walnut", which is in Crispin Lane behind the home end. Walking towards the Town Centre you will find a Wetherspoons outlet called "The Elihu Yale" in Regent Street. A little further on is the "Horse & Jockey", a thatched pub with a decent offering of real ale and good food. The FA have banned Trent McClenahan for one game after the Hereford United defender was sent off in the Carling Cup game against Leicester City last Tuesday evening. Trent McClenahan: Suspended from all first team football until the Club have completed 1 first team match for a Sending Off in a match played on 19/09/2006. Boston boss Steve Evans has pleaded guilty to fraud at his trial at Southwark Crown Court. Evans, who is on trial with four others, denied the charges when the case was first heard in January and again yesterday when the trial started but changed his mind on the second day of the trial. The case is expected to last four weeks. Former chairman Pat Malkinson has also changed his plea, but the club's former accountants Ian Lee and Brian James, plus current General Manager John Blackwell, all deny the charges. Evans was originally banned for 20 months for his part in the illegal payments to players that assisted Boston's rise into the Football League. The initial Football League inquiry led to the current investigation and court case. BBC Hereford and Worcester have announced that there will be full match commentary of the Hereford United/Wrexham game for those around Herefordshire who are unable to get to the Racecourse this coming Sunday. The broadcast will be on 94.7FM only, not on the internet. As ever Keith Hall be will the man with the microphone. Kick-off is at mid-day. Meanwhile, Phil Joslin from Nottinghamshire will be the referee at this game. The Hereford Times has printed a story confirming that 50 vehicles have been speckled in paint following a mistake by contractors painting Hereford United's Len Weston Stand, now sponsored by Floors2Go, which is next to the A49. "A valeting company in Hereford was engaged to clean up and I believe that the work is completed and those affected are happy with the outcome." From that quote it appears that Floors2Go paid for the valeting. Graham Turner can not see the benefit of a marketing man/commercial department at present. The Hereford United manager told this week's fans forum that he thought there was a limit to what could be sold from the club. He said that all the advertising boards around the ground had been sold and the match programme was sold out. There are still a few gaps for mascots and ball sponsors but Turner said the club had cut down on match sponsorships simply because of slight changes in the boardroom. There are plans to do up a small kitchen and it is hoped that in time that the club will be able to provide match day sponsors with hot meals rather than a cold buffet. Turner said a commercial department could cost around £30 thousand to set up and "we haven't got £30 thousand pounds worth of activities to sell." "When you've only got small gates and a small city there is limited commercial potential - you are going to the same people all the time. "I don't think there is the capacity to start a commercial department at present," he concluded. However he didn't rule one out in the future. Earlier Turner revealed that the deal with Floors2Go, who now sponsor the Len Weston Stand, was worth a five figure fee. The Bulls travel to the Racecourse Ground for the first time in 13 years for a league fixture that they have generally had the better of. Wrexham won all four encounters at the Racecourse in the '70's but the Bulls won or drew every other meeting between the sides until the last encounter in March 1993, when Wrexham ran out 2-0 winners. Two FA Cup encounters since that final league match have ended up one each, both at Edgar Street. A televised FA Cup encounter saw the Bulls run out 1-0 winners thanks to an Ian Wright goal, while an LDV match in January 2005 saw Wrexham win 2-1 with Danny Carey-Bertram getting the goal for the Bulls. Veteran midfielder Darren Ferguson is the only player likely to feature on Sunday that played in the FA Cup match, having recently notched up his 300th appearance for Wrexham, while only three of the starting XI for the Bulls in the LDV match 20 months ago are still at the club. The Bulls will look to inflict misery on a defence that has conceded 14 goals in three games. Stuart Fleetwood's removal from action on Tuesday night appeared more precautionary than a serious problem and the Welsh u-21 international will look to cause problems for some of his international colleagues alongside what is expected to be a full strength Bulls side. Wrexham had been going well until they forgot how to defend. Successive five goal defeats, the first coming from the direct route of Accrington, saw a better performance against Birmingham on Tuesday night but after surviving 90 minutes at 1-1, extra time was back to previous form as three more goals sailed in at the wrong end. The financial struggle of previous seasons, and a long drawn out stadium battle, are pretty much behind the club and they spent the summer signing local bred players. Defender Ryan Valentine joined after four years as a regular, and with a new contract offer on the table, at Darlington, and striker Neil Roberts, who left Wrexham six years ago for £450,000, both rejoined their home town club. Wrexham vs Hereford United, Racecourse Ground, Sunday 24th September, 12noon. Bristol Rovers are one of several clubs in League Two that have an early purchase scheme for visiting supporters to buy tickets in advance of a game and save £2 per ticket by doing so. Hereford United visit Bristol on Wednesday September 27th, kick-off 7.45pm, and supporters can purchase tickets from the club. The game is not all ticket and supporters can still pay as they enter the ground. Hereford United say that they will accept cash/cheques for tickets. Leicester defender Alan Maybury has added to the voices saying Trent McLenahan's red card was harsh. Speaking to the Leicester Mercury, Maybury said: "I know it's difficult for the referee. Our physio said 'I don't think we'd have complained if he (McClenahan) had got a yellow as well'. "But I know there's an assessor in the stand, and the referees have to follow the letter of the law. I can see why the referee made it. But if it had been only a yellow we wouldn't have complained." On the incident for the Bulls penalty Maybury, who claimed he was on the line as the last man, added: "To make it clear to the ref, I stayed there when some of the lads went to protest. He saw that and that saved our 'keeper. We knew it was going to be difficult. The way Conrad kicks the ball is a great asset to us, so we knew we could just turn them and kill them off and play from there. In the first half, we did that well, but at the start of the second half we never got going. We gave them hope. Issue Number 94 of Talking Bull, the Hereford United fanzine, went on sale last night at the Carling Cup game. The front page has a photo of Richard Rose gestering towards a referee and on the back cover a photo of BBC Hereford and Worcester's Keith Hall prompting a caption competition. Amidst the contents are articles by BTA Jim, the Rambler, Billy Bollox, Chris Jones, New Meadowender, John Barleycorn and Simon Wright. Included is a tribute to Roger Griffiths penned by Richard Tomkins and two articles discussing the merits or otherwise of Milton Keynes. And other hilarious piece mocking Kidderminster Harriers from Colin Arpet. Talking Bull will be on sale next Sunday at Wrexham and costs just £1. "I thought neither of them were red card offences, Patrick's challenge was innocuous - maybe there was a little push. "It was always going to be a difficult place to come. Hereford are well-organised and are still on a high after coming out of the conference. Things are on a high here, so it's a good result for us and the players applied themselves in the right manner. Hereford had their positive spell after the break and we weathered the storm well." "We did not play at all in the first half. After the break, we built up a head of steam and played well to get back into it. We were so docile in the first half, anybody could have beaten us. We came out with venom in the second half. "We deserved better on the strength of our second half performance. I thought their keeper made a number of good saves. Maybe he was lucky to stay on the field after giving away the penalty. I cannot understand how he (the referee) has got those two decisions so different." Cup upsets were few and far between compared to Round One. Scalp of the night goes to Crewe, who beat a strong Premiership Wigan 2-0, while Championship side Barnsley succumbed 2-1 to MK Dons - the only League Two side definitely through - despite a Michael McIndoe goal. There were some other near misses, with Accrington going out on penalties to a reserve Watford side featuring will-he/won't-he loan prospect Dominic Blizzard, Darlington also lost on penalties to Reading, while Hartlepool lost on the spot kicks to Hull. Sunday's opponents Wrexham held a strong Birmingham side for 90 minutes, but crumbled in extra time, to lose 4-1. Leicester City progressed to the third round of the Carling Cup with a 3-1 victory against Hereford United at Edgar Street this evening. The Championship side's extra ability shone through by the end of the game, although they were helped along the way by some questionable decisions by the referee and his assistants. Hereford's first eleven was unchanged from Saturday, but Andy Ferrell and Phil Gulliver returned to the bench at the expense of Sam Gwynne and Gareth Sheldon. United couldn't continue from where they left off against Bury though as, other than an early burst from Stuart Fleetwood, Leicester enjoyed the better of the first half. Elvis Hammond in attack for City had a good early chance when offside wasn't given, but he scuffed his shot before Wayne Brown made a fantastic save, tipping Iain Hume's effort wide. Danny Tiatto crossed from the left moments after, and Gareth McAuley headed against the cross bar. Another delivery from the left was met by Richard Stearman was deflected over before the visitor's pressure finally paid off when Hammond smashed the ball home from just inside the box. He managed to hold off Tamika Mkandawire before hitting a powerful shot on the turn, delighting the 578 away fans. United came back at their higher graded opponents, but it was McAuley who came closest to equalising with an own goal before the interval. Andy Williams and picked out Tim Sills, whose head back across goal was sliced by the defender, forcing 'keeper Conrad Logan into a save. The second half began with United a renewed force, with Rob Purdie who'd played poorly in the first half taking the game to his former side. He almost netted two minutes into the half when he broke out of midfield to latch onto Travis' ball, but a slight deflection carried his effort wide, via the outside of the post. Trent McClenahan had headed wide after Brown triggered a counter attack before Purdie crossed for Martyn Giles at the near post, but Logan denied him with a low save. With eleven minutes of the half gone though, Hereford were back on level turns when 'keeper Logan took down Fleetwood, who threatened to round him and The Bulls were given a penalty. Logan though was only yellow carded, though nobody worried too much about that, at the time, as Purdie converted the spot kick. Logan didn't dwell on his mistake though, and was in action again moments later, denying Fleetwood who tried to curl in from twenty yards. Sills was next to be kept off the score sheet by the 'keeper as his looping header from Travis' cross was punched away, with Logan at full stretch. The ball fell to Fleetwood who forced Logan into another terrific save from an angle, and Logan was helped out by his defence as a third effort from Richard Rose arrived. Then, totally against the run of play, The Foxes were back in front. A corner wasn't dealt with on sixty six minutes, and Stearman evaded Sills at the far post to steal in for Leicester's second. Things went from bad to worse for United, as Fleetwood pulled up injured, allowing Alan Connell to be introduced. It was what happened in the seventy sixth minute that angered United fans though, as McClenahan was penalised, having felled Levi Porter in the box, but the only difference from this challenge and Logan's earlier one, was that McClenahan saw red, much to the annoyance of the home fans in the crowd of 4,073. Hume stepped up and gave City a two goal advantage. United didn't back down though and were threatening again soon after as Dean Beckwith headed over Purdie's corner, before Sills saw a low effort blocked by Logan. At the other end, Brown was called into some rare second half action, and he saved superbly as McAuley headed powerfully from close range. With a minute left on the clock, the referee had his red card out again following a collision with Patrick Kisnorbo and Sills, leaving both sides with ten men. Logan, who arguably shouldn't have been on the pitch, still had another save to make in injury time, and did so superbly well, denying Connell's close range volley. So United were edged out in the end, but had the referee laid down the law and shown Logan a red card when he felled Fleetwood, the outcome could well have been much different, as the 'keeper went on to prove himself as City's best and probably most important player on the evening. Hereford will be able to take many positives from their second half performance into their game next Sunday against Wrexham. HUFC: Brown, Giles, Mkandawire, Beckwith, Travis, Purdie, Rose, McClenahan, Williams, Sills, Fleetwood. Subs: Gulliver, Thompson, Ferrell, Jeannin, Connell. LCFC: Logan, Kisnorbo, Maybury, McAuley, Stearman, Wesolowski, Tiatto, Low, Porter, Hume, Hammond. Subs: Henderson, Johansson, Sylla, O'Grady, Dodds.